On the corner of Queen Street West and Noble Street in Toronto's Parkdale neighbourhood stands a large billboard with black text on a white background. That's not so unusual, except that the text is in Anishinaabemowin — the Ojibway language. In English it translates to: "If you want to learn something, first you must learn this." On the corner of Queen Street West and Noble Street in Toronto's Parkdale neighbourhood stands a large billboard with black text on a white background. 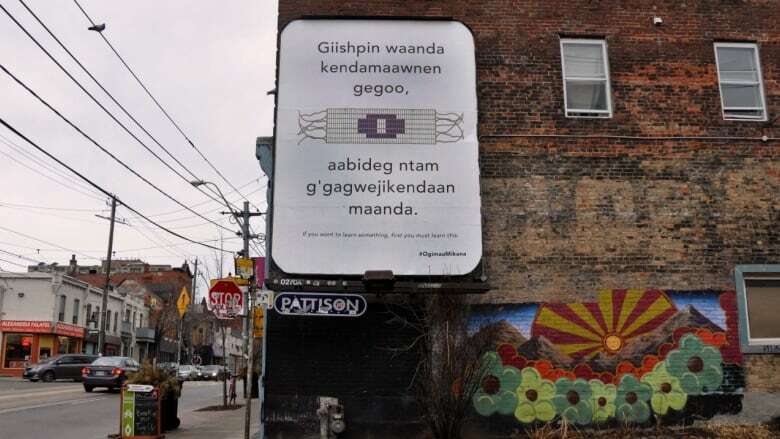 That's not so unusual, except that the text is in Anishinaabemowin — the Ojibway language. In English it translates to "If you want to learn something, first you must learn this." It is the work of artists and activists Hayden King and and Susan Blight. The billboard is part of a project called Ogimaa Mikana that the duo created a few years ago. "Ogimaa is a leader, someone who leads the people. 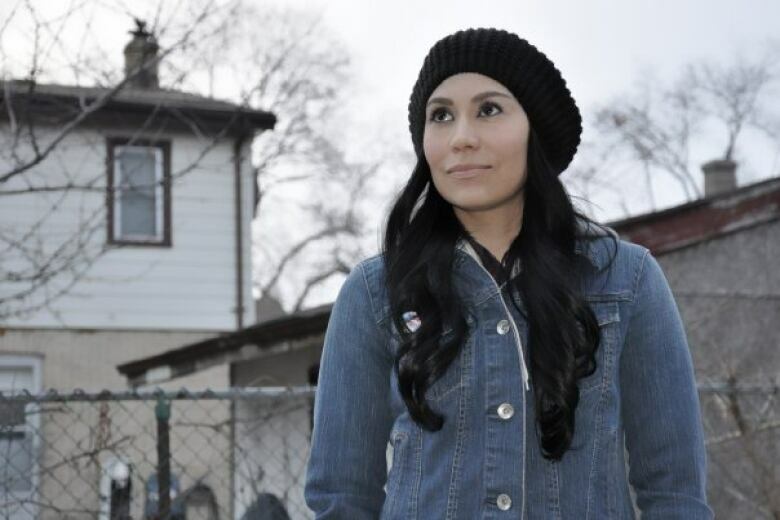 Mikana refers to a road, a trail, a path, anything that is travelled upon," explained Blight, an Anishinaabe visual artist, filmmaker, and arts educator. Susan Blight is an artist and member of the Couchiching First Nation in Ontario. (Supplied)Blight, who is a member of the Couchiching First Nation in Ontario, said the project began in 2013 at the height of the of Idle No More movement — when she was learning Anishinaabemowin. The two made a stickers with Ojibway translations of Toronto street names that they plastered over the English signs, beginning with Queen Street, or Ogimaa Mikana. Blight said she and King wanted to assert Indigenous presence in a city that, despite having a large Indigenous population, does not reflect their culture in public art, buildings or street signs. The location of the billboard in a high traffic and multicultural neighbourhood was also intentional. "I think that people need to understand that we live on occupied territory," Blight explained. "That the settler/colonial system is not legitimate. That the Anishinaabe people, the Haudenosaunee people of this territory are the original caretakers of this land and we've done a very good job for 15,000 years. So we have a lot of knowledge that we can share." New Anishinaabe immersion school opens in Kenora, Ont.